President Obama went to Mexico last week and had negative things to say about his country's economy and immigration policy and lots of positive things to say about Mexico. But his student audience was wondering what country he was talking about. Obama praised the open press and the growing middle class. A very sunny situation in Mexico. … "Obama is fantastic, but I believe that today he was talking about another country, not ours," said Rosa Castro, 43, a college professor. "My question is: Who wrote Obama's speech? Enrique Peña Nieto's team?" In his speech, Obama praised a growing middle class to which the majority of Mexicans belong. Although it is true that Mexico has a strong manufacturing base that has allowed many Mexicans to prosper, economists say the middle class has been stagnant for years. The World Bank says 49% of the population lives in poverty. 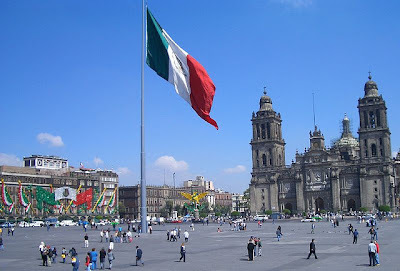 The photo: Plaza de la Constitucion in Mexico City from Wikipedia. Click to enlarge.